Practical and portable do-it-all widget for computer and iOS recording. Clever device with both mics and interface. Compatible with iOS, Macs and Windows. 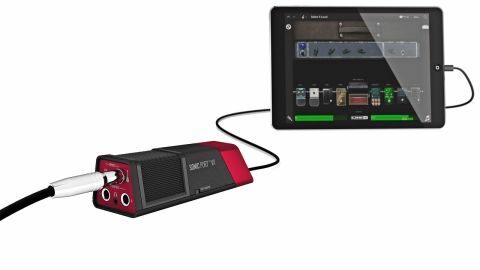 Line 6's new Sonic Port VX is designed to provide everything you need for recording to an iOS device or a Windows computer. Not just a 16-bit/48kHz audio interface with a guitar input, the VX also incorporates both stereo and mono condenser mics with preamps, plus it includes a mini-jack stereo input. "The guitar input has 120dB of dynamic range, so translates your tone and playing dynamics really well"
On top of that, you get another stereo mini-jack for headphones, plus left and right jack outputs to connect to a monitor system. The VX comes with Lightning and USB connector cables, is instantly compatible with iOS devices and Macs, and can work with Windows machines if you install the drivers. You also get Line 6's Mobile POD iOS app for free. The VX can either screw onto a mic stand or camera tripod, or can sit on your tabletop on its own easily-angled stand. Simply choose between guitar, stereo mic or mono mic inputs, set the gain with the knurled wheel and you are away, maybe after setting the direct monitor switch for zero-latency monitoring. The guitar input has 120dB of dynamic range, so translates your tone and playing dynamics really well, the stereo mic is cool for room recording - such as gigs and practices - while the mono mic is suited to capturing vocals or close-micing an acoustic guitar. Line 6's Sonic Port VX covers all of the bases, from connecting your guitar to amp sims, through to recording. Easily portable and bus-powered, it will let you play or record wherever your laptop or iPad is.